After Christmas, I had a few gift cards to use, and there was a tartlet pan I'd had my eye on for a couple of years, and so, I bought myself a little present. 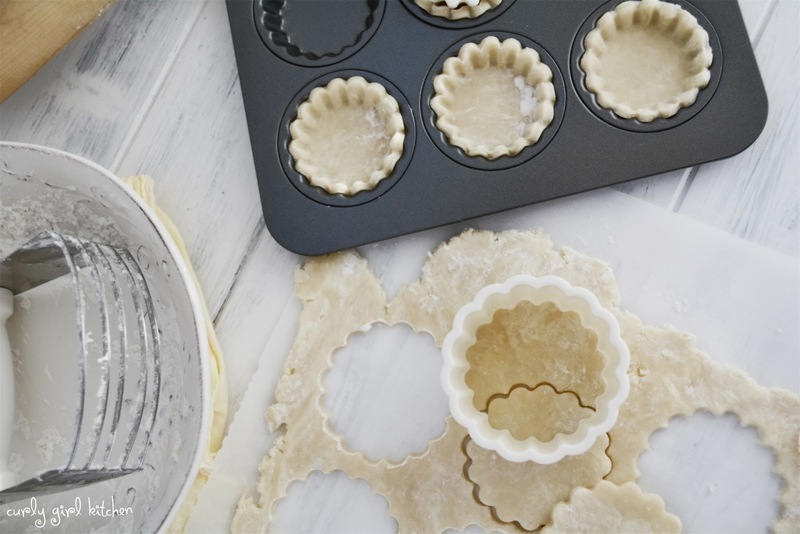 This particular tartlet pan was special because it came with a cutter that was sized to cut perfect circles of dough for the pan, and a little tamper to press them into place. I'll admit, those two pieces aren't an absolute necessity, and I've made plenty of more rusticly shaped tartlets using just my fingers, but this set sure makes it easy to get pretty results. 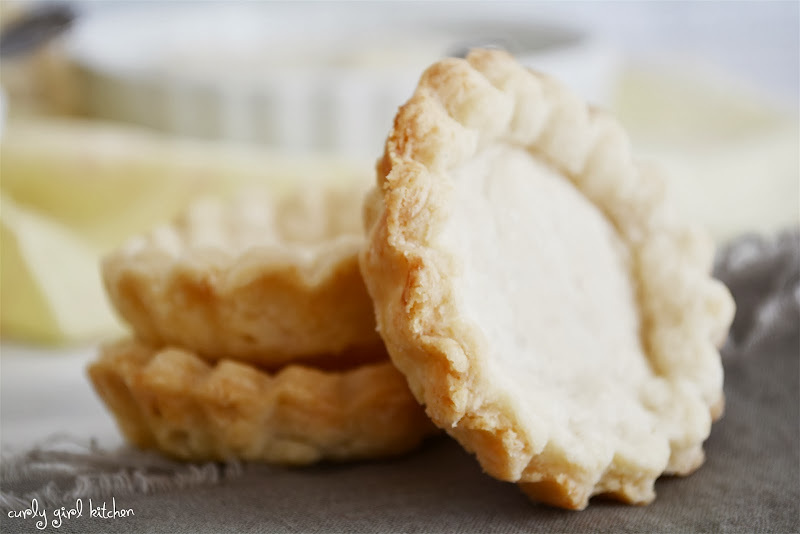 After unwrapping the pan and setting it aside, Jamie began asking me on a daily basis, "So, when are you going to make some little tart pies?" 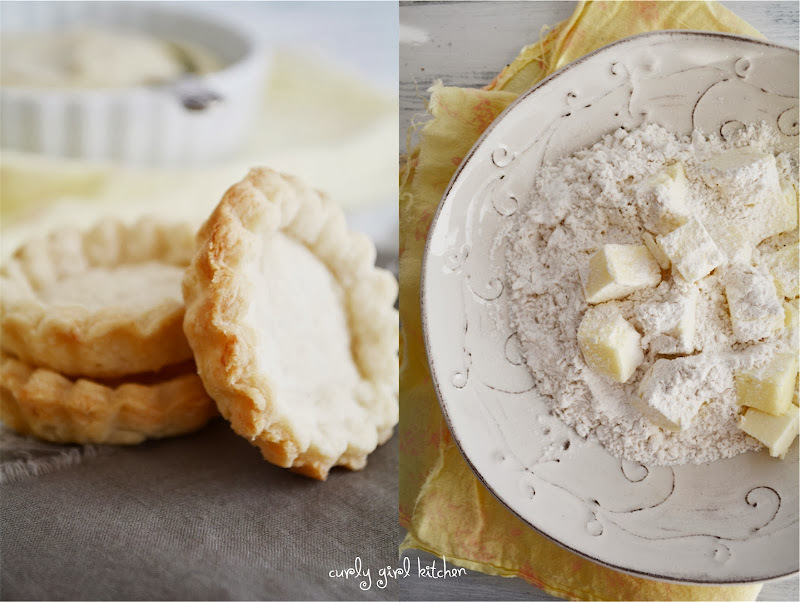 The next weekend, with a bowl full of pale yellow bits of butter sprinkled over flour, I made pie dough and happily began cutting and pressing the dough into the tart pan. My only complaint about the pan would be that it only bakes twelve at a time, and I would have liked to get more finished all at once, so as it was, I cut the remaining dough into circles and refrigerated those until the first batch was finished baking. Even so, the pan worked beautifully, and I was really happy with how the tartlets turned out. So with the tartlets baked and cooling, I started on the salted caramel sauce and I made more than enough for the tartlets so that there would be plenty of caramel leftover - I have plans for that caramel sauce this weekend for a treacle tart I hope to bake on Sunday if I'm feeling better by then. With the treacle tart dancing through my thoughts, I felt inspired to watch Harry Potter today, the first sick day I've had to take in a long time due to the first cold I've come down with in at least three years. I shouldn't complain though, since a cold every few years isn't so bad as far as getting sick goes, but since I get sick so rarely, it really takes it out of me when I do. And sadly, Jamie is refusing to kiss me until I'm better, so that I don't pass my germs to him. Maybe he'll at least trade me a kiss for a treacle tart. 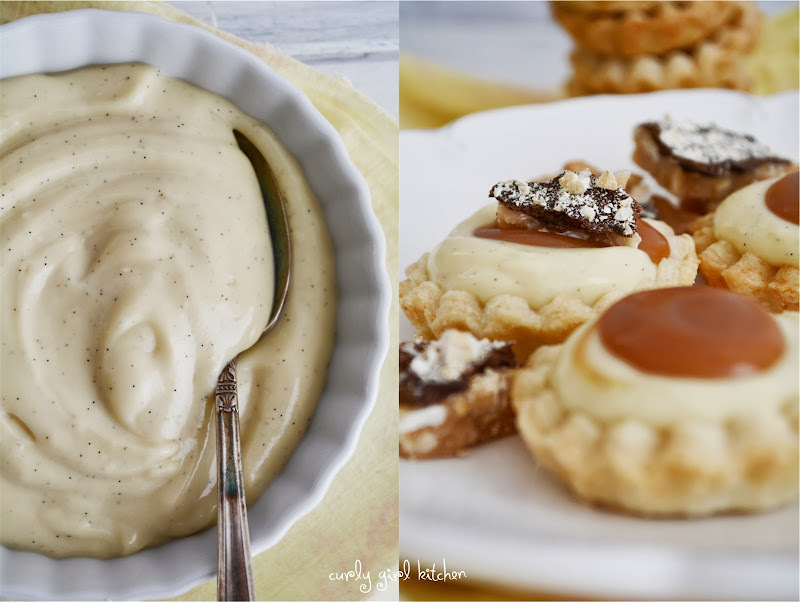 The caramel sauce was a rich, dark amber, thick and sweet, with hints of sea salt and vanilla. I poured it into a jar to cool, and then made the custard, a creamy vanilla bean custard to spoon into the tarts and top with dollops of caramel. 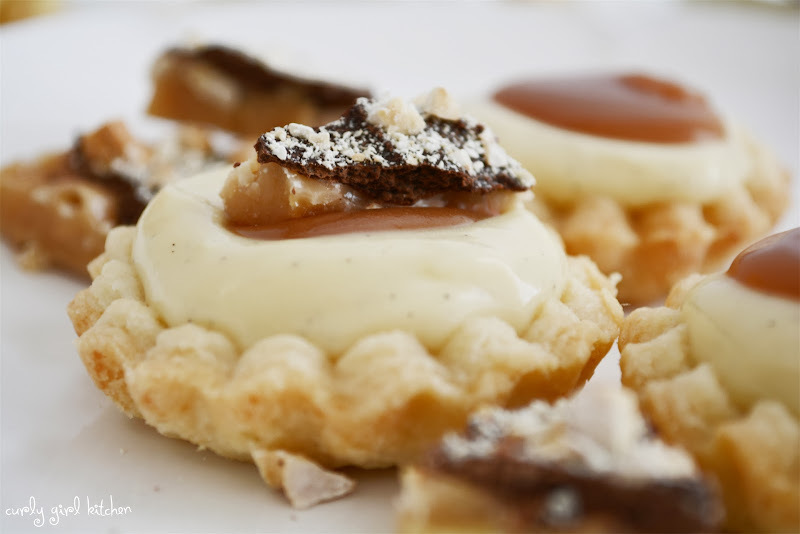 We even had a few pieces of homemade English Toffee left from Christmas to sprinkle over the tartlets. They also freeze nicely, so I may bake a whole bunch some weekend and freeze them (unfilled, of course) to use in the future. 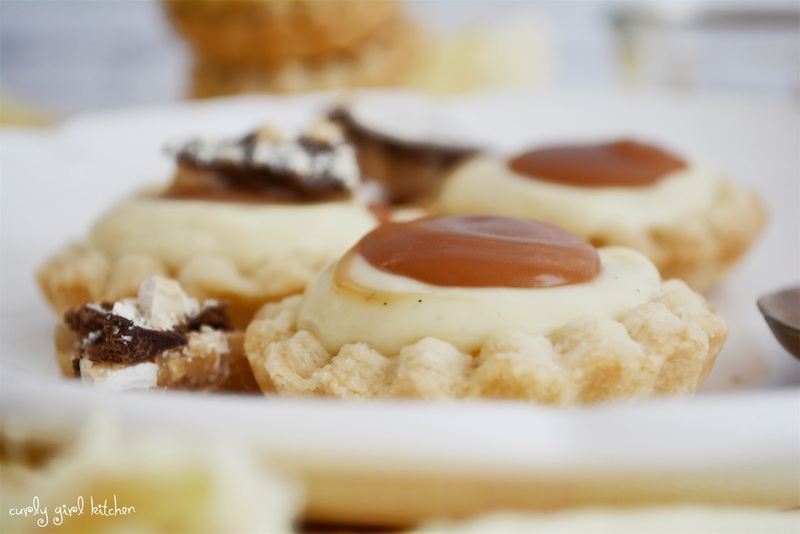 Aren't the tartlets pretty? They were the perfect little two-bite dessert. And now, I think I should rest, and maybe take a little nap while I watch more Harry Potter. 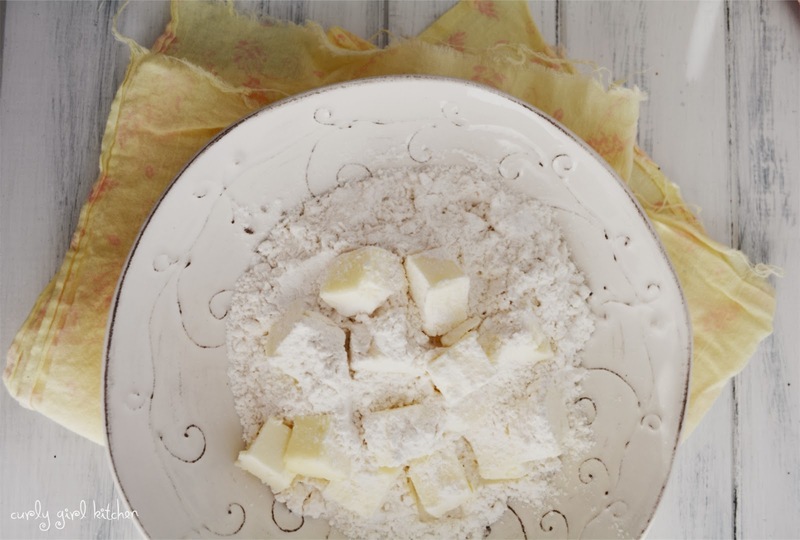 In a bowl (or your food processor), combine the flour, sugar and salt. Cut the butter in with a pastry cutter until pea-sized pieces of butter remain. Add the ice water and work the dough with your hands until it comes together. Roll the dough out to ¼ inch thick. 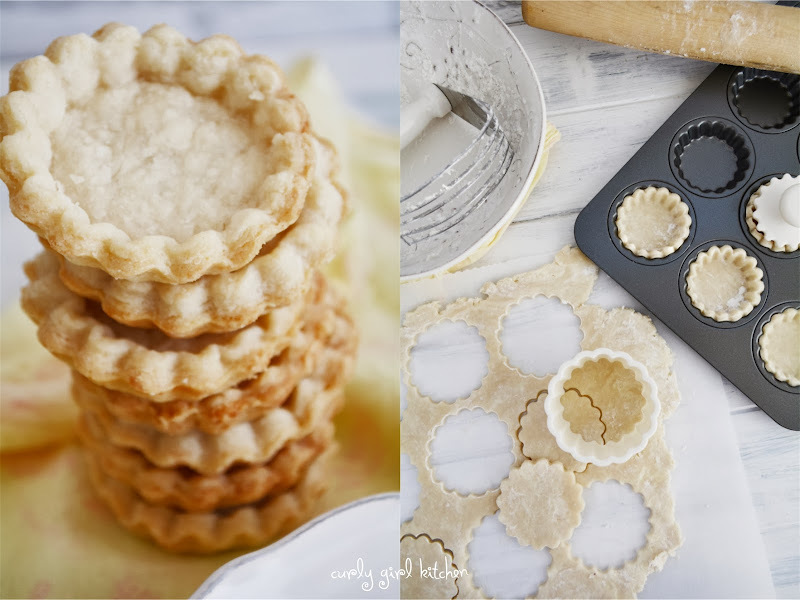 Cut into rounds and fit into your tartlet pan or molds; gather up any scraps and roll out again. Preheat the oven to 375. Bake the frozen tartlets for 15-17 minutes, until golden brown. Let cool for a few minutes, then gently remove from the pan and cool, uncovered, on a wire rack. In a large, heavy-bottomed saucepan, combine the water, sugar and corn syrup. Warm the mixture gently over low heat until the sugar is dissolved (I kept mine on low heat for as long as I could before the sugar started to bubble, about 15 minutes). 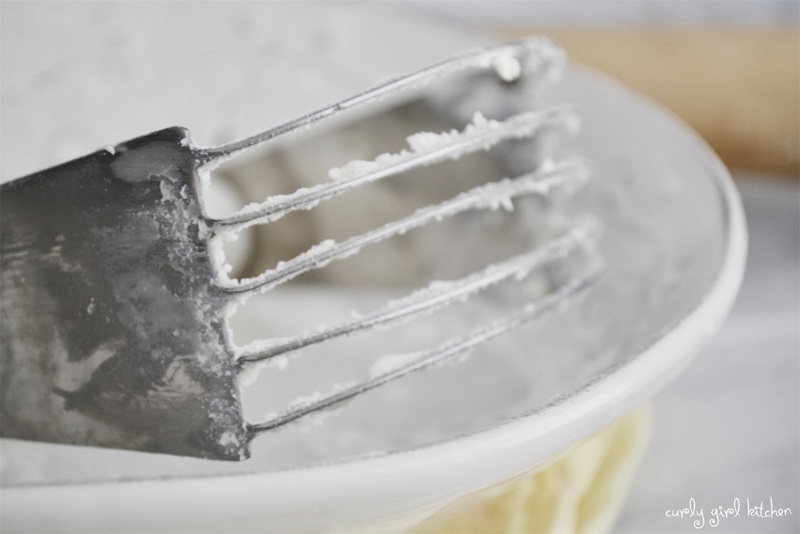 Wash down the sides of the pot with a wet pastry brush to get rid of any sugar crystals, then turn the heat up to medium to medium/high. Cook, without stirring, until the sugar becomes a deep amber color (may take from 5-10 minutes). Remove from the heat and pour in the cream - the mixture will bubble up quite a bit. Stir briskly to incorporate the cream; if the mixture seizes up at this point, return it to the stove over low heat, and cook, stirring constantly and vigorously, to dissolve any lumps and/or sugar crystals. Stir in the butter, one piece at a time until incorporated, then stir in the salt and vanilla. If any lumps remain, pour caramel through a fine mesh strainer into a glass jar. Whisking constantly, bring the custard to a boil over medium heat, then cook for 2 minutes until thickened. 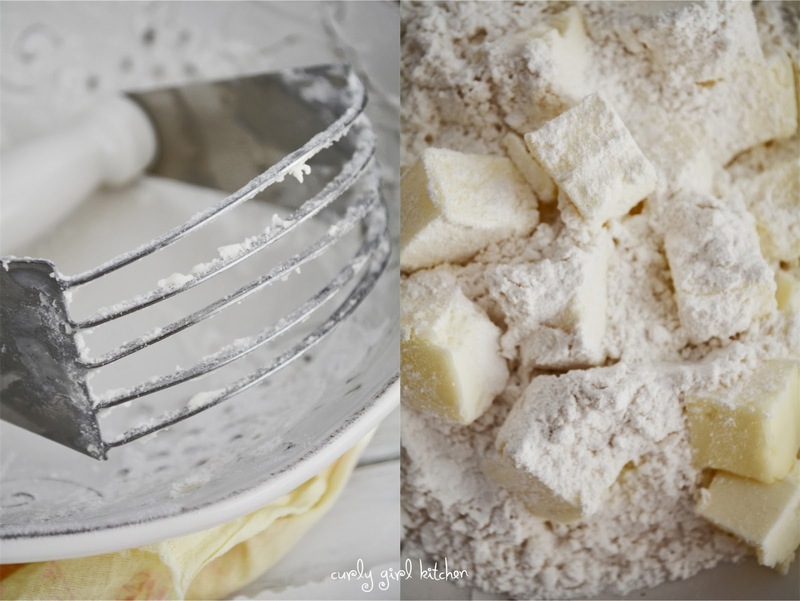 Remove from the heat and whisk in the butter, 1 tablespoon at a time, until smooth. Pour into a bowl and cover with plastic wrap, right against the surface of the custard. Refrigerate until thoroughly chilled. Note, to speed up the chilling process, you can place the bowl of custard in a larger bowl filled with ice water, and whisk the custard to bring the temperature down more quickly. 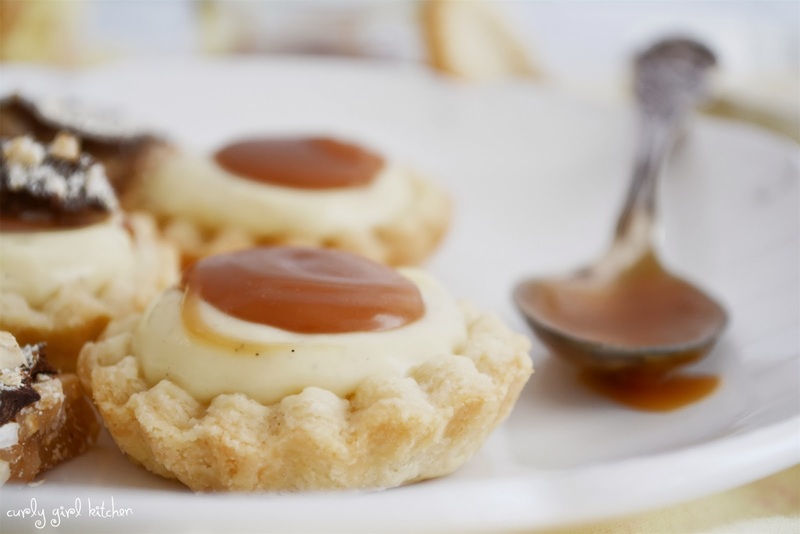 Spoon two teaspoons custard into each of the tartlets, then spoon a half teaspoon caramel into the center of each. Garnish with a piece of toffee, if you like. 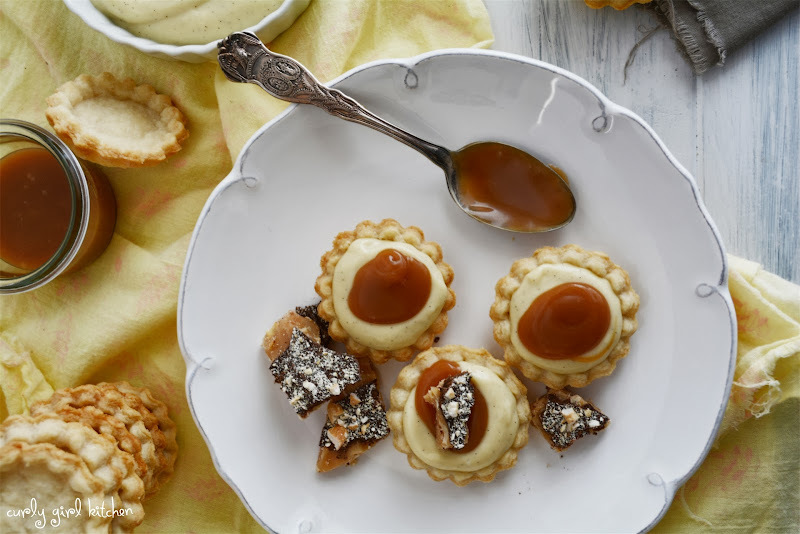 Yields enough pastry and custard for approximately 18 tartlets, and plenty of caramel leftover. these are so beautiful! 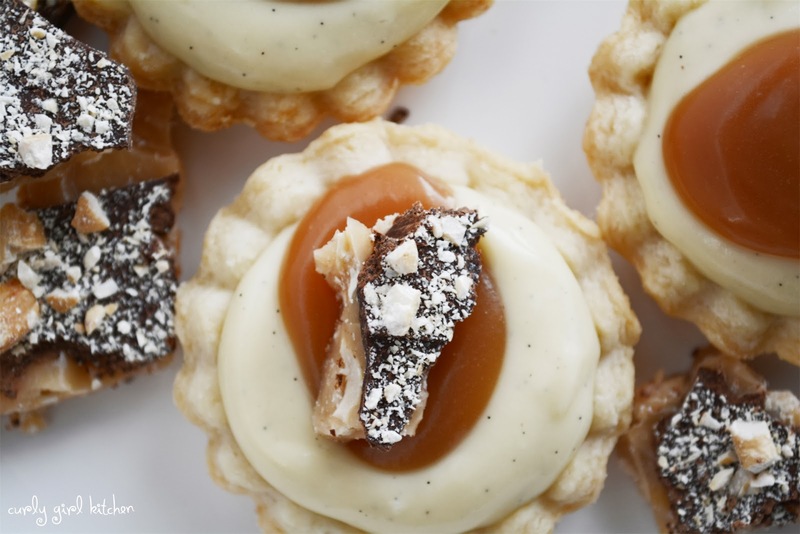 the vanilla bean, pooled caramel, uch dying of jealousy over here! I have yet to find a thermometer I'm really happy with, but hopefully you are having success with yours! 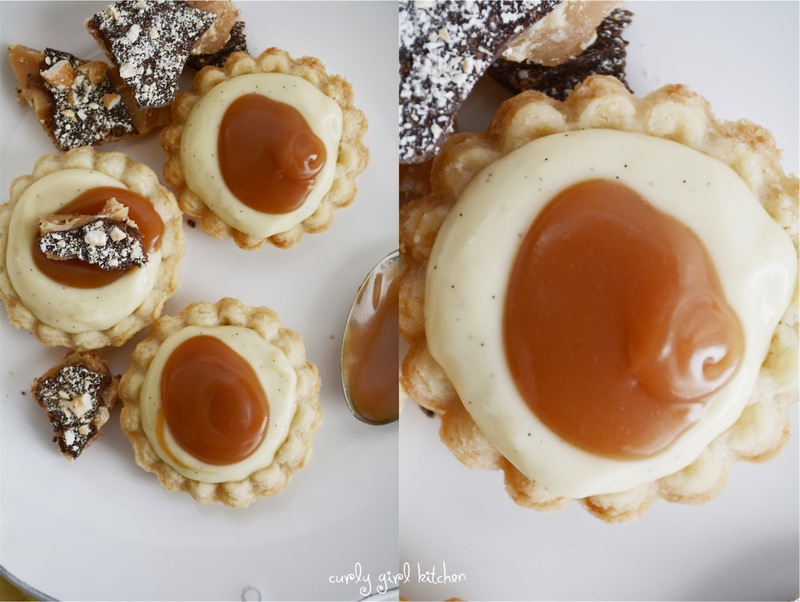 I was looking for a recipe for salted caramel and vanilla bean tarts and was so excited when I came across your recipe! 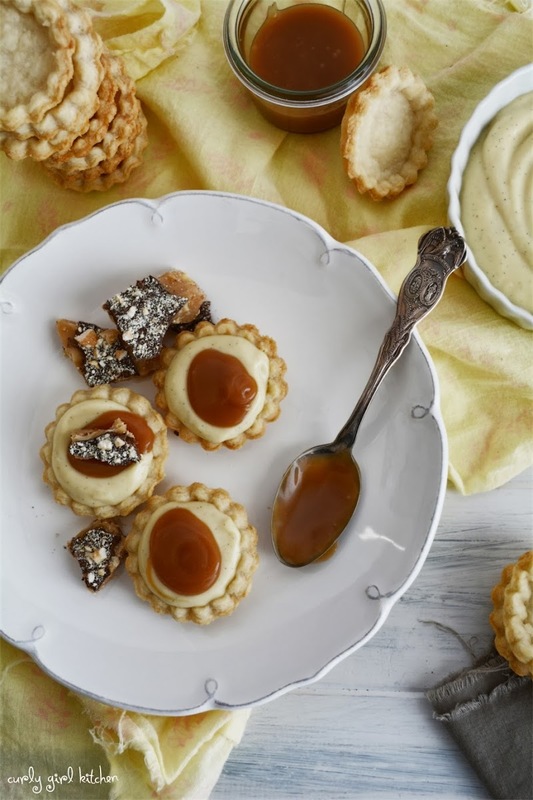 These tarts were the perfect balance of flavours. The salted caramel recipe is fantastic...good thing it makes a big batch because I ate a lot of it while I assembling the tart :-) Made these for a group of book club friends last night and everyone raved about them and asked for the recipe. Thank you so much for sharing! Can you substitute with vanilla extract? 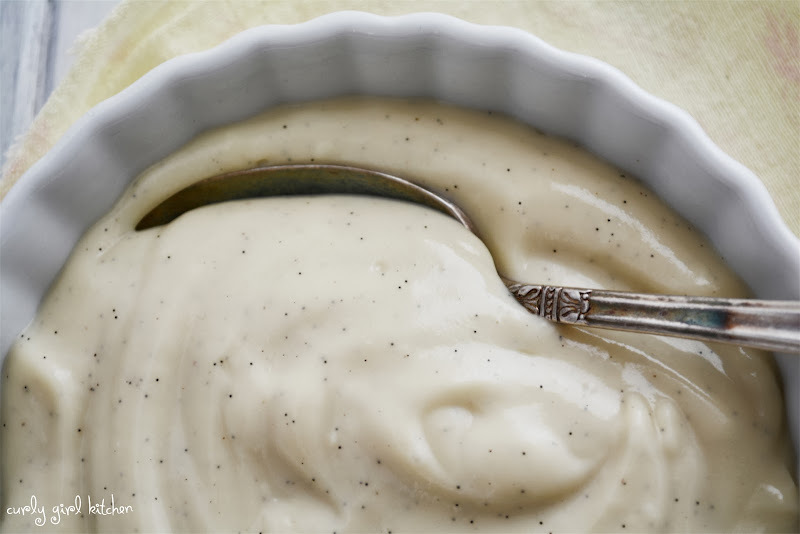 The vanilla bean gives it the best flavor, but you can certainly use good quality vanilla extract instead.